The Periodic Table gives the names and symbols of all the elements. It is arranged in order of increasing atomic number (the number of protons). The vertical columns are called groups and numbered 0 to 7. Take note that group 0 is at the rightmost column. The horizontal rows are called periods. They are also numbered 0 to 7. The vertical columns of elements on the Periodic Table are called Groups. Elements in the same group have the same number of electrons in their outer shell (also called the valence electrons). It is the outer electrons of an atom that are mainly responsible for the chemical properties of any element. Therefore, the elements in the same group have similar properties. The horizontal rows of elements on the Periodic Table are called Periods. 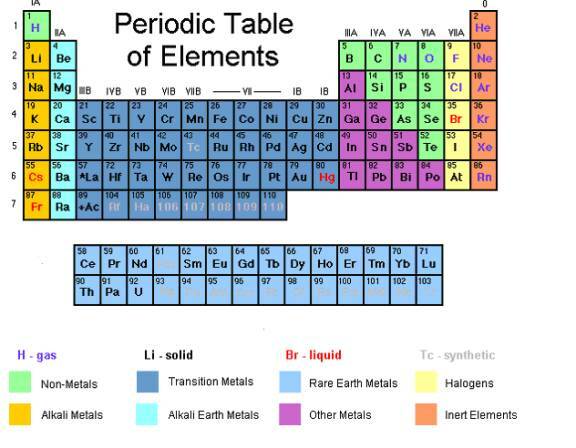 Over three-quarters of the elements are metals. Only two groups, the halogens and the noble gases, are completely non-metal. Hydrogen has one outer electron like the Group 1 metals. However, hydrogen is a gas and usually reacts like a non-metal. The elements in each numbered group show trends in their properties. For example, as you go down Group 1, the elements become more reactive. As you go down Group 7, they become less reactive. Properties of alkali, alkaline earth and transition metals, Halogens and noble gases. The following video looks at 4 main groups of the Periodic Table: Alkali metals, Alkaline Earth metals, Halogens and Noble gases.